We want you to walk out of Harrel Eyecare with everything you need to see clearly and protect your eyes. After your Tulsa optometrist prescribes the lenses you need and our on-site eyewear laboratory produces them, one of our helpful team members will walk you through our selection of stylish eye care solutions. Our optical gallery in Tulsa includes a variety of prescription eyeglasses, sunglasses and frames. At Harrel Eyecare, your ocular health is our first priority. Whether you have an ocular condition that requires special eyewear or you just want sunglasses with prescription lenses, we offer a variety of protective frames and lenses that improve your visual clarity while preventing further damage. They just so happen to be stylish, too. Your eye care needs are unique, so your ideal eyewear solution should be customized to meet them. Our optometry team focuses on the needs of each individual patient, performing thorough examinations to carefully evaluate the state of their vision and eye wellness. When we prescribe your lenses, we also take your tastes, lifestyle, and overall health into account. If you spend time outdoors in Tulsa, for example, we recommend polarized, UV-resistant sunglass lenses with protective frames. We are equipped to produce these lenses in your specific prescription, but we also offer clip-on and wraparound options for your convenience. UV damage and glares are no match for modern eyewear technology, and we encourage you to take advantage of our specialty options to fully protect your eyes. When you see better and look better, your quality of life improves along with your ocular health. At Harrel Eyecare, you can fill your prescription without settling for frames that don't suit your style, face shape, or budget. Our optical gallery includes a variety of frame colors, shapes, and materials, and we will work with you to make sure you're completely happy with your choice. Browse our selection of designer frames or work with our in-house production team to customize a pair that meets your unique needs. 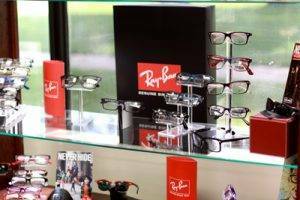 We carry special needs frames, protective athletic lenses, designer collections, and frames that are available in a variety of colors and sizes. No matter what you usually wear, we have an eyewear option that will suit your preferences and make you feel like yourself. Of course, our overall goal is to improve your vision and make everyday tasks easier and safer. Whether you stare at a screen all day or drive to a night shift job, your new glasses will include the proper prescription to eliminate errors, improve your eye health and comfort, and make you feel more confident in the world. To schedule an appointment with one of our Tulsa optometrists or learn more about our optical gallery, contact Harrel Eyecare at (918) 745-9662, or visit our eye care center downtown or in south Tulsa. Browse through our collection of over 1000 eyeglass frames. And before you purchase, use our Virtual Try On tool to see what they look like on your face. Just click on the frame of your choice and upload a photo of your face - it's that simple!